Often funny, exaggerated, and cartoonish, the caricature has long been a popular method employed by artists and political satirists to lampoon celebrities; one need only browse Instagram to see that the art of caricature is alive and well. With his caricatures, however, Giambattista Tiepolo turned his skill in a playful direction, magnifying familiar eccentricities in a comical way with a few strokes of his pen. Accenting the absurd but lacking in malice, the drawings reflect the artist’s humorous take on his neighbors, revealing an often compassionate, frequently quirky, and always mirthful view of Venetians that Giambattista and his sons would have encountered, immortalized through lighthearted character studies. Like Giambattista’s caricatures, satirical drawings of political figures and famous faces seen on Instagram continue to employ the method of exaggeration for humorous effect. However, unlike the parodies shared by millions of users across social media, Giambattista’s sketches were intended for a more intimate audience. Yet his images have found their way to the public through the centuries, serving as a testament to the whimsical side of an iconic 18th-century Italian painter, and his contribution to the timeless art of humor. 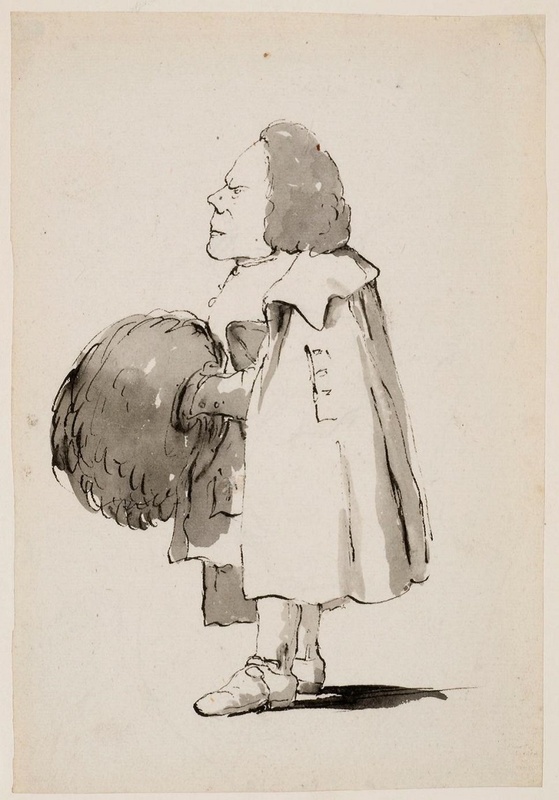 Giambattista Tiepolo, Caricature of a Standing Man, Facing Left, with his Hands in a Muff, 1755-60. Pen and dark brown ink, brush and brown wash on cream laid paper, 8 3/4 x 5 3/4 inches. Eskenazi Museum of Art, The Anthony Moravec Collection of Old Master Drawings. Giambattista Tiepolo and his son, Domenico, were Venetian artists with Europe-wide fame, creating paintings, prints, and drawings, as well as palace frescoes from Milan to Madrid in the 18th century. More than two centuries later, works by these renowned artists will be offered for public view at the Crocker in Masters of Venice: Drawings by Giambattista and Domenico Tiepolo from the Anthony J. Moravec Collection. In addition to 21 works by the Tiepolos, Masters of Venice will feature drawings by several other accomplished Venetian artists of the era, including Ubaldo Gandolfi and Giuseppe Bernardino Bison, as well as 12 Venetian drawings from the Crocker’s permanent collection. Come inspect these characters for yourself through February 4th. Learn beginning drawing techniques while gaining an understanding of how artists use a variety of media. Compare and analyze various media combinations on display in the exhibitions Richard Diebenkorn: Beginnings, 1942-1955, and Masters of Venice: Drawings by the Giambattista and Domenico Tiepolo from the Anthony J. Moravec Collection, then develop your own drawing style through experimentation and use of new tools and techniques. Instructor: Abigail Vancannon. Register here. Enjoy priority viewing of the exhibitions Masters of Venice: Drawings by Giambattista and Domenico Tiepolo from the Anthony J. Moravec Collection and Exuberant Earth and Ceramics by Ruth Rippon, docent-led spotlight talks, art activity and more! Complimentary wine, refreshments and snacks included in the special member lounge. Reservations required by October 20, 2017. Register here. Adelheid Gealt and William Breazeale on the "Masters of Venice"
An expert on Domenico Tiepolo, and curator of the exhibition Masters of Venice: Drawings by Giambattista and Domenico Tiepolo, Adelheid Gealt will visit the Crocker from Indiana University for a lecture highlighting the breadth, importance, and charm of the father-son duo considered two of the finest Old Master artists of 18th-century Venice. The Crocker’s curator of the exhibition, William Breazeale, will follow Gealt’s lecture with a presentation on works from the Museum's own collection that are included in the exhibition. Attendees will have an opportunity to preview the exhibition before it opens to the public. Register here. Inspired by the exhibition Masters of Venice: Drawings by Giambattista and Domenico Tiepolo from the Anthony J. Moravec Collection, as well as 18th-century Venetian clothing, a live, costumed model will pose in the galleries to bring the artwork to life through drawing. Visitors ages 5 and older can sketch at their own pace while receiving informal drawing instruction. No experience necessary, and all supplies are provided. Drop-in. Though certain artists—the Tiepolos, Boucher, and Fragonard among them—are well known to us, the 18th century is still being explored, especially in the world of drawings. This course examines the styles and subjects current across Europe in the age of the Tiepolos. As well as gaining a wider knowledge of Italian drawing, students will come to know traditions and innovations in drawings of the French, Dutch, and German in the 18th century. The Crocker's strong collection of 18th-century German drawings—perhaps the finest in the United States—will form a major counterpart to the Venetian art of the Tiepolos. Instructor: William Breazeale. Register here. Cover photo: Giambattista Tiepolo, Caricature of a Short Gentleman Facing Left, with a Large Muff, 1755-60. Pen and black ink, brush and gray washes on cream laid paper, 8 5/16 x 5 3/4 inches. Eskenazi Museum of Art, The Anthony Moravec Collection of Old Master Drawings.